Our Triple Pedestal Dining Room Table is built for all sorts of occasions and is definitely for someone looking for a very large table. If you have a large family or host a lot of large dinner parties then this is the table for you. With all extensions in, this solid wood dining table can seat over 20 people and measures 22 feet long. The Amish craftsman that makes this table actually has the exact same one in his home dining room since he has a very large family! We suggest allowing 24" per person when you are planning on how many extensions to order. We also suggest ordering more if you think you will want them later as we do not sell the extensions after the table has been made. This triple pedestal table is family friendly and built for durability and strength. Choose to order your solid wood table in oak, cherry, walnut, soft maple or walnut wood. Custom wood choices are available upon request. Please call for pricing on other hardwoods such as quarter sawn white oak wood, elm, hickory or rustic wood options. After you select the wood for your table you then need to select the stain or paint option. We have a wide variety of finish choices that will beautifully complement the wood selection. Our sales associates are happy to send out wood finish samples to help you make this important decision for your new dining table. You can also see our finishes in person at our showroom in Sarasota, Florida. 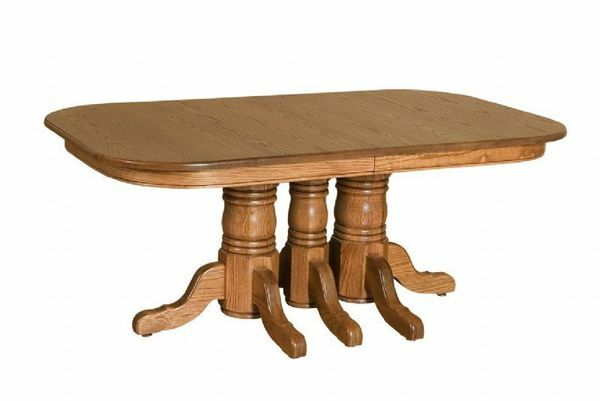 This triple pedestal table comes standard in a 42" width with a 72" length and a 1" solid hardwood top. The end columns are 8" wide and the center columns are 6". We also offer a 44" or 48" width if you are looking for some extra seating at the end and serving space in the middle of the table. With the 48" width you can actually seat two people at each ends of the table. Custom dining tables are available so please call for a quote if you have changes to would like to make to this triple pedestal table. The extensions on this table are 12" wide and a quantity of 10 extensions are included in the base price of the table with an option to order up to 6 more extensions for a total of 16 extensions. If you are looking for an extra large American made dining table then look no further then this Amish triple pedestal table. The extensions come standard without skirts or aprons on the underside of the table. If you don't have skirts or aprons on the extensions then you will see a gap in the table skirt when the extensions are in. You can choose to order skirts on all or some of the extensions. Just remember that with the aprons that are harder to store. This large dining table does require some assembly when it arrives. The table top and pedestal will need to be attached. The assembly is not difficult and should not take more then an hour. If you prefer to have someone else do the assembly for you then be sure to upgrade to our white glove delivery service. With our inside delivery service the drivers will bring the table inside to your dining room and assemble it for you. Then all you need to do and set the table and enjoy! Question: Is this table really made from real wood and not veneers? Answer: Yes! This table is Amish made from 100% solid hardwood. You even have the choice of the wood that you want the pedestal table to be built in and the finish! Question: This is a really large table how hard it it to put the table leaves in? Answer: All of our pedestal tables come with double equalizer slides where one person can easily pull the table on one side and the other side opens on it's own. The leaves are then easily placed inside fitting easily together with pegs and holes. Question: Can I place hot plates or dishes right on the table? Answer: Our tables are varnished and finished with a very durable, double catalized varnish however we do still recommend that you use trivets or hot pads underneath hot dishes. Question: Can I order this table in a 50" width? Answer: We can customize most of our Amish furniture. Please call one of our sales associates at 1-866-272-6773 and they are happy to work up a custom furniture quote for you on your custom dining table. Custom furniture is a speciality at DutchCrafters. Question: My kids like to do their homework at the table. Do I have to worry about scratches and pen marks appearing in the hardwood? Answer: We do recommend that you are careful of scratches on your new hardwood table. The finish is protective against this, however moving sharp surfaces against hardwood will often leave a scratch. Certain woods are harder then others. Oak wood is a very hard wood while cherry wood is a much softer wood. One of the most common ways that tables get scratched is scooting dishes across the table top so pick things up when you move them. If you have any additional questions we are happy to help answer them! Just give us a call at 1-866-272-6773 and one of our friendly sales associates will be there to answer all your questions and help get your order placed for your new dining table. You can also stop by our Amish furniture store in Sarasota, Florida to sure our furniture in person. Dear Dutch Crafters: Thank you for the beautiful piece of furniture. The table and leaf cabinet both cme to my house yesterday. The delivery man was very accomidating and the furniture was put together without any problems. Thanks again for all you help.